How do you know someone is a vegetarian? Because they tell you. Jokes aside, we don’t want to poke fun at leaf-eaters, because it must be a very hard lifestyle decision to make and stick with. It’s not like they can cheat on their diet and have a sneaky pork sausage. It’s a commitment. To Never Eat Meat. 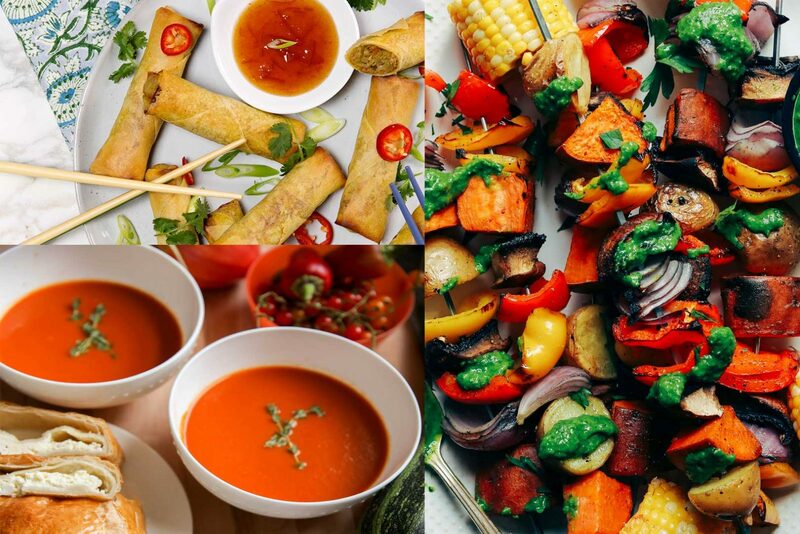 We decided to look into it (for a friend) and found some awesome vegetarian braai ideas. When your Veggie friends arrive, keep your other guests calm and avoid staring. They are Superhumans who can ignore the smell of a braai chop yet salivate over beans. One thing you can be absolutely sure of – they don’t bite. Make the circle bigger so everyone gets a piece of the atmosfire, while enjoying some appetizers. There is a wide variety of bokkies-kos that you could serve up. There’s the old chip-and-dip (not the biltong flavor), or you can try real baked potato chips or cheese chips with halloumi and tartare sauce. Or, fill samoosas and spring rolls with any conceivable vegetable. Tweak the kebabs by substituting that succulent lamb cube with a potato, cauliflower, butternut, and onion. In fact, just add the fridge veg drawer to the fire and you’ll have a buffet of vegetarian braai ideas. Vegetarians do not eat fish (verified by Google), so no fishy ideas will be included in our vegetarian braai ideas. However, sushi can be, as long as you stick to the avocado and vegetable fillings. Although not a very common option as a braai starter, you could be a pioneer and have a veg soup and bread option to help fill up those veggie stomachs. Homemade breadsticks, garlic bread, baguettes, or toasties, and of course, potbrood are definite sides to include with salad or veg toppings, or as a soup-or-sauce dipper. Everyone enjoys a good salad or a warm veggie side, and we could suggest a few thousand. We will start with filling veg with veg, or beans, or cheese, or rice or quinoa. You can stuff most veg with any vegetarian filling. Butternut, any squash, potato, mushroom, pepper, cabbage, spinach, etc…etc. Grill it over the coals or bake in the coals, either way, you will have some really lekker sides to serve everyone. Mix it up with cold salads and warm salads. Green salads, pasta salads, rice salads, vegetable salads, fruit salads. There really are thousands of salads for vegetarian braai ideas. Having a display of colorful food with a variety of dressings will a bit of flair to your vegetarian dishes. If it can grow in a garden, it can go in a vegetarian salad. However, you can also add soy products that look like chicken, bacon, or meat in a toss-up. Yes, you can braai chicken, bacon, or meat for vegetarians because its fake meat. Fake chicken looks like chicken and tastes like chicken, but it’s not chicken. Its mostly made from soy and surprisingly quite tasty. So, you can still grill up some ‘sausage’ and ‘burgers’, and ‘chicken breasts’ for your veggie guests. Sausages are made from soy, veg or tofu, and the burger patties can be made from potatoes, other vegetables, and/or beans. It might seem challenging to come up with a whole bunch of vegetarian braai ideas but it’s easier than you think. It’s not about offering a piece of bread and salad while your meat-eating friends dive into a pile of steaks and ribs. With a bit of thought and planning you will be able to come up with a variety of scrumptious dishes that will satisfy every braai guest’s tummy.